Aqua Hotel *** in the center of the small plot offers 20 tastefully decorated, family-style rooms. The hotel provided direct access to the thermal spa, a swimming pool, thermal pool and fun, as well as a sauna provides relaxation and refreshment. 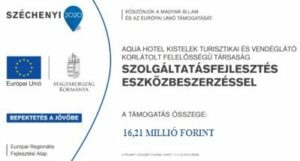 The hotel is located just 25 km from Szeged, along the M5 highway or main road E75 easy reach up to Szeged, up from Budapest. The hotel can provide comfortable accommodation for around 54 persons, double and triple rooms and apartment type. The rooms and bathrooms, air-conditioning, mini-bar and free WiFi access is available. The hotel has its own restaurant and cozy café. The restaurant offers a buffet breakfast and a warm kitchen on site. The bar serves wines and spirits specialties round out the meal experience. The restaurant is ideal for conferences, family or business events, which in connection with kitchen facilities are also available. Parking is available in the hotel’s car park, which is free for guests. Whether you want a bit of quiet and relaxation, as the area’s famous sights or colorful programs attract many family-style hotel welcomes you and your family all year round! Dynamic small town of 8,000 inhabitants, the center of Kistelek small area that Csongrad County. Kisteleket installed the city of Szeged in 1776 to protect one of the station towards the Buda Szeged Post Road. It rises in the center of the early Classical style parish church, at the foot of the world war monuments. Built in the neo-classic Baroque style, named after Szent István Roman Catholic church it was declared a national monument in 1958 by the National Office for Monument Protection. The car worthy chapel proclaims that the city Kistelek Catholic faith has always been deeply religious people lived. Joseph Chapel Kocsó Kocsó merchant and his wife in the small cemetery for outdoor section, Gémes Teréz was built in 1899 granted by the municipality for free on site. at the same time in front of the chapel they were completed public offerings of Calvary is the stations. The Petofi street Rákóczi and reverse some dry entrance gate house preserved peasant civil architecture of the 1920’s, 30’s character. Today, this row of houses civilian peasants remained only in traces, therefore preserved these buildings deserve townscape importance and protection. The creators of folk cultural heritage of the local representative of the most famous folk artist Gyifkó Gyula. The equestrian equipment admired hand, harness maker based on individual work patterns and traditional Hungarian and international equestrian competitions. Son takes his craft working with him further. Kistelek Pro-Art Dance Studio will host a Small Lot Open International Dance Competition since 2002 in several categories. During the three-day event to compete in pairs measured standard, Latin and Dance competitions. During the competitions fair presentation and outdoor dining also await visitors. You can give in to temptation and visit us! The Aqua Hotel *** awaits its guests year-round quality service, reasonable prices and the area is rich program selection!